High-flying students could have part of their tuition fees paid off in exchange for becoming teachers in deprived areas under plans being drawn up by Labour. The idea is part of a package of proposals unveiled by shadow education secretary Stephen Twigg in his speech to the Labour conference. But with money tight Mr Twigg says it is just an aspiration at this stage and the details are still being worked out. Mr Twigg wants teaching to be "an elite profession for top graduates". Like the previous Labour government he sees improving the status of the profession as the key to raising standards. He said that in the most successful education systems, such as Finland and South Korea, teaching is a prestigious and sought-after career for top graduates. He wants to expand the work of the Teach First charity which recruits high-quality graduates into teaching. This will also mean having a pay system that can attract and retain high calibre students, says BBC education correspondent Sean Coughlan. He added that Mr Twigg's suggested tuition fee subsidies might raise questions about whether this would mean more local flexibility over pay, which is likely to raise tensions with the teachers' unions. Labour's former education minister, Lord Adonis, who has pushed the importance of raising the quality of teaching, has also argued that teacher training courses should be concentrated in a much smaller number of leading universities, with high entry requirements. Mr Twigg wants to pilot the debt write-off project before the next general election via Labour-run councils. But he admitted there was "a lot of work to do" to draw up detailed figures on how much debt would be covered or how many schools would be included. Teacher numbers have fallen by 10,000 in one year under Education Secretary Michael Gove, he will tell delegates. Doubling the number of top graduates coming through the Teach First scheme at year to 2,000 could be done within existing budgets, he will say. Mr Twigg would also look at creating a National College for Teaching Excellence, in the style of medical Royal Colleges, to boost in-job training. 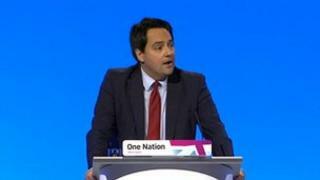 "We have the best generation of teachers ever," he will tell the final day of Labour's conference. "But it can be even better. We will establish a New Deal for Teachers. New rewards and new entitlements to training and with the responsibility to improve year on year." Picking up on Ed Miliband's new one-nation slogan, he said: "The key to One Nation Education is not the type of school but what happens in the classroom. Our education system is only as good as its staff."